The Foundation Stone for St. Stephen’s church building was laid 23rd June 1880 and can be seen on the outside of the East wall in Belbeck Street, bearing the inscription SS AD 1880. “To the Glory of God Most High and in commemoration of St. Stephen, Deacon and Martyr”. This memorial stone was laid on Wednesday the 23rd day of June in theyear of our Salvation 1880 by the Revd. Edward Westerman, MA., Vicar of the Ecclesiastical District of All Saints’ Elton. The site of this Church was the free gift of the Right Hon. Edward Henry, Earl of Derby and the cost of its erection was defrayed by Public subscription, together with the sum of £400, granted by the Manchester Diocesan Church Building Society, and also a sum of £125 by the Incorporated Church Building Society. Signed Edward Westerman, MA., Ralph Parkinson Dinfield; MA., Samuel Walker, George Bradley, James Richardson Crompton, Building Committee. Visitors are struck by the width of the church, with its splendid Chancel. The style of the curved apse behind the Altar is unusual in an English church of the period, being much more a feature of continental churches especially in France. After admiring the width of the church however, it soon becomes apparent the length of the Nave is not in keeping. At the time the church was built, plans for a much deeper building had been approved, but finances were difficult. So it was decided to build only a Chancel, the Nave to the extent of the three arches, and the lower part of the Bell Tower. Two more Arches and the Bell Tower were to be built at a later date; but they were never completed as planned. The West wall of the church, leading to the main entrance is still the original ‘temporary’ construction. Building had begun in faith in the December of 1879; when the Foundation Stone was laid only a small amount of the necessary funds had been raised. The original tender had been for £5,575. 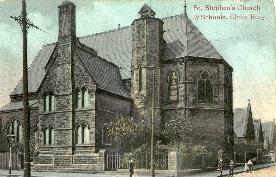 Fund raising still continued after the consecration of the church on 22nd May 1882. Through continued generous donations improvement and additions were made. The Stone Font was erected in 1883, the Stained Glass windows in the Sanctuary at Christmas 1898. The present Organ was installed in 1893 and like the church itself was never completed; an extensive upgrade was completed in the year 2000. The three light stained glass windows in the South wall were donated in 1903, depicting Jesus ‘The Light of the World” flanked by St. Peter and St. James. The window depicting St. Columba and St. Aiden ‘two Celtic Saints’, was donated in 1930. The same donation provided the window in the Lady Chapel and at the same time the Lady Chapel was furnished, The oak prayer desk was given in 1940 and designed by the donor himself. Improvements and additions continue through constant generous donations to this day. In the year 2000 the carpet was replaced, purchased from the money raised by the Millennium Flower Festival. The porch was completed in 1959 costing £5,000. One of its interesting features is the unusual design above the external door, a symbol of the Resurrection Hope and the Fire of the Holy Spirit. The Bishop of Manchester consecrated the porch on 10th April 1960 and, at the same time, part of the church garden was also consecrated for the Burial of Ashes. To mark the centenary of the church, £15,000 was raised for the building of a new room on the North East corner. Much of the building and decoration was done by the men of the church. The ‘Centenary Room’ is in continuous use by the church and other groups in the community. We give thanks for the work and worship of our church over the years and to all those who have contributed to the life of St. Stephen’s in so many different ways.